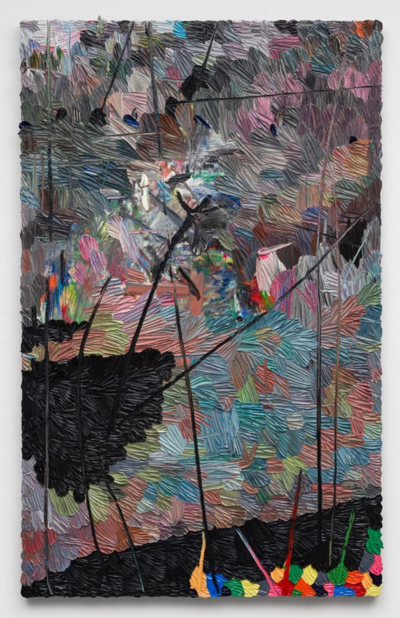 Marianne Boesky Gallery is pleased to present whatever, a vibrant holiday, the gallery’s first solo exhibition of work by Los Angeles-based artist Dashiell Manley, who joined the gallery in February. The exhibition will feature a new series of paintings, titled Elegy for whatever, which explores the emotional and psychological experience of the breaking news cycle and furthers the artist’s ongoing engagement with the subject. The exhibition will be on view from October 27 to December 17, 2016 at the gallery’s 509 W. 24th Street location. A concurrent exhibition of new work by Berlin-based artist Matthias Bitzer will be on view in the adjacent Boesky East at 507 W. 24th Street. Elegy for whatever is the third body of work in which Manley uses repetitive, labor-intensive techniques to effectively ‘work through’ and process the daily news. For his New York Times series, the artist transcribed every word from the front page of the newspaper onto canvas in watercolor pencil. He then brushed water over the text, blurring it into near abstraction. In some of these works a silver-tinted wash—a byproduct of other projects—was also applied to the surface of the canvas, further obscuring the text and adding a semi-reflective finish. In his most recent series, Various sources (quiet satires), Manley reproduced existing images—such as political and topical cartoons—in ink and watercolor pencil, altering and collaging them in order to dislocate their meanings. He then painted linear forms over them in order to further abstract the messages. whatever, a vibrant holiday represents both a continuation and disruption of Manley’s years-long engagement with daily global news. The works that comprise the Elegy for whatever series are personal and emotional responses to the gripping, and often difficult, aspects of the news emphasized in his previous series. Manley translates the feelings and moods invoked by these stories into gestures and movements, resulting in highly textured, colorful, and entirely abstract canvases that capture the psychology of an experience. The new works also mark an evolution in Manley’s practice, as he engages more deeply with oil paint—sculpting the paint with a palette knife on the canvas surface, creating both a physical and emotional depth. Manley found this clause, combined with the current slang meaning of the word, to be particularly ironic given the violence that has occurred in the decades following the document’s publication. The phrases in brackets, which complete the titles of individual works, are references to specific story headlines, prompts, or historical contexts and dates. Manley’s work will also go on view at the Cantor Arts Center at Stanford University on October 6, as part of New to the Cantor, a newly developed series launching this fall. The exhibition is the Cantor’s first spotlight presentation focused on an emerging artist, and marks Manley’s first solo exhibition at a museum.